Abby Baker of IDP UK with (from l. to r.) Sang Fajun, Liang Xushu, Mao Lei and Sheng Yanhai of the Dunhuang Academy during a training visit in October. But we can offer a lot more and 2008 promises to be busier for us than ever with exciting new collaborations, research projects and, of course, digitisation, to make the collections ever more accessible. In 2007 we launched the education section of the website offering resources for teachers, students and researchers with the aim of reaching beyond the scholarly community. We welcome your research papers to add to those already online. Work is now underway on developing 'My IDP', a personalised web space, and on palaeographical tools, both of which will be available by spring next year. We hope these enhancements will make the resource even more powerful and useful for scholars and others worldwide and we welcome your feedback. Apart from the web development work, the six months since the last issue of IDP News have been, as usual, a busy and productive time for IDP. We were very pleased to host the Seventh IDP Conservation Conference at the British Library in May and welcomed long-standing and new colleagues working on conservation of Central Asian material worldwide. At the end of the year we launched conservation pages on the website which we hope will be of interest and use to many of you. Brief details of both of these are given in our regular conservation roundup on along with one of the papers from the conference (on the manufacture of Asian inks). Other papers will be available online and published in future issues of IDP News . This is a summary of a much longer article that will be published shortly. Details will be given in IDP News . Wang Jiqing presented this paper at the Stein and Dunhuang conference in May 2007. He has previously written on Magistrate Wang and the photograph shown above in IDP News 10. Since the eighteenth century, the desolate and largely uninhabited land around Dunhuang had been reclaimed by immigrant farmers from central China. An additional land tax called caimailiang (采买粮) had been levied on them. In the nineteenth century, Dunhuang peasants repeatedly petitioned all levels of the government for the abolition of the tax. Considering that the revenue was indispensable for meeting administrative and military expenditures of the Dunhuang local government, the authorities always refused their petitions and suppressed their resistance. In April 1902, Wang Zonghan (汪宗翰) was appointed Magistrate of Dunhuang. During his term of office (1902-06), the caimailiang crisis escalated. From autumn 1905 the peasants refused to pay the tax. In March 1906, the provincial government shifted Wang Zonghan from Dunhuang to Lanzhou and appointed Huang Wanchun (黄万春) as Magistrate of Dunhuang. Huang Wanchun's top priority was to deal with the caimailiang crisis, but by autumn 1906 the peasants were still refusing to pay the tax. Wang Jiayan, the Magistrate of Dunhuang from March 1907. This is a detail of a photograph taken by Stein in June 1907. The complete picture shows Wang with his wife and mother-in-law. At the end of 1906, Sheng Yun (升允), Viceroy of Shaanxi and Gansu (陕甘总督) who resided in Lanzhou and governed Shaanxi, Gansu and Xinjiang (pictured below), dispatched Wang Jiayan (王家彦) (pictured right) to Dunhuang to carry out an on-the-spot investigation. Wang Jiayan submitted a report to the effect that both government and peasants should make concessions and the tax should be reduced by half. In spring 1907, Dunhuang suffered a diphtheria epidemic, although not as serious as those in 1870, 1871, 1895 and 1900. At such a critical moment, Wang Jiayan was appointed Magistrate of Dunhuang with a special mission to relax the tension by solving the caimailiang problem for good. On the evening of 11th March 1907, Wang Jiayan accepted the official seal from Huang Wanchun. It was on the very day that Aurel Stein and his party entered the Dunhuang oasis from the west. To this point Sir Ernest Satow, British Minister at Peking, really paid attention. After repeated false translations, Stein's official position was mistakenly designated as 'Prime Minister of Education of Great Britain' (大英国总理教育大臣) on his Chinese passport issued by the Wai-wu-pu (Chinese Foreign Office) on 10 September 1905. (3) To any Chinese officials of western China, this title would frighten them out of preventing Stein from doing anything. Stein arrived at Kashgar on 8th June 1906, where he engaged Jiang Xiaowan (蒋孝琬, Chiang Ssi-yeh) as his Chinese secretary. In the course of the subsequent two years, Jiang Xiaowan greatly assisted Stein by dealing with all Chinese officials. Before Stein entered Gansu, he asked his old friend Pan Zhen (潘震), Daotai (道台) of Aksu, to write a series of recommendation letters to officials of western Gansu, including Huang Wanchun. On his arrival within the Gansu border, Stein sent a telegraphic salutation to Sheng Yun. Newly-arrived Wang Jiayan had not had time to acquaint himself with any official documents or letters concerning Stein's visit and consequently neglected this unexpected visitor. When Stein paid his first visit on 13th March, Wang Jiayan ‘had just managed to dig out from his predecessor's office records the elegantly worded epistle by which my Tao-t'ai patron had recommended me to the magistrate's attention.’ (4) Reception and protection of such a distinguished foreign guest must have been a heavy burden on this new Magistrate whose utmost concern was to treat the more serious caimailiang problem. Stein next called on Lin Taiqing (林太清), Commander of Shazhou Battalion (沙州营) in charge of local public security. On Stein's arrival, Lin Taiqing lost no time in dispatching his soldiers to act as Stein's camp guard. After their first meeting on 13th March 1907, Stein realized ‘that Lin Ta-jên enjoyed more authority in his own sphere than Wang, the newly arrived civilian, did in his, was quite clear. … Luckily the two dignitaries were on excellent terms, and the magistrate was only too anxious to let me benefit by the predominant local influence of his military colleague.’ (5) Lin Taiqing, who controlled the real power of Dunhuang, would be responsible for Stein's safety. In response to Stein's salutation telegram, Sheng Yun sent a telegraphic circular to several Daotai and all magistrates of Gansu by the end of March, strongly recommending Stein to official notice. Hence Wang Jiayan and Lin Taiqing became more attentive to Stein and more vigilant over his activities. On 21st May, Stein and his party arrived at the Mogao Caves and were welcomed by Wang Yuanlu (王圆禄). An officer and some soldiers of the Dunhuang army were sent by Wang Jiayan and Lin Taiqing to accompany Stein's party to the caves, in order to watch and guard them. On 23rd May, Stein dismissed the soldiers and entered Cave 17 for the first time. From that afternoon, Stein secretly selected manuscripts and paintings from various bundles in Cave 16, without being noticed by the soldiers or worshippers. 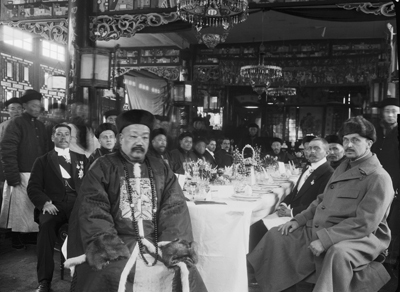 Sheng Yun, Viceroy of Shaanxi and Gansu, hosting Mannerheim and his expedition in Lanzhou. Wang Yuanlu was persuaded to sell Stein what the government had sealed up for safekeeping in Cave 17 ‘on the solemn condition that nobody besides us three was to get the slightest inkling of what was being transacted, and that as long as I kept them on Chinese soil the origin of these "finds" was not to be revealed to any living being.’ (6) On the morning of 29th May, the transaction was settled. In order to avoid the eyes of the supervisory soldiers, all selections were transported by Jiang Xiaowan and Stein's trusted followers under the screening shadow of the steep river bank. When Stein was busy with his work at Mogao, Wang Jiayan devoted himself to the settlement of the caimailiang issue. After some radical peasants refused to accept the official conditions, an angry Wang Jiayan decided to resolve the tax problem by force. Fearing a riot which might expose Stein to danger, Wang Jiayan and Lin Taiqing reluctantly postponed their military action. Stein's prolonged stay at Dunhuang in such an eventful period had given alarm. Apparently based on Wang Jiayan and Lin Taiqing's reports, Chai Hongshan (柴洪山), Commander-in-chief of the Suzhou Garrison (肃州镇) responsible for the peace of western Gansu, wrote a report to Sheng Yun in April 1907. (7) It said that he believed Stein's archaeological activities would inevitably turn towards tombs, that the popular prejudice thus aroused might expose Stein to personal risks, and that the provincial government might be exposed to inconvenient trouble too. Sheng Yun soon gave instructions enjoining Wang Jiayan to dissuade Stein with all diplomatic politeness from any attempt at excavation. On the morning of 31st May, a military officer of Dunhuang (Liu) was sent by Lin Taiqing to visit the Mogao Caves to investigate Stein's activities. Uneasy with a guilty conscience, Wang Yuanlu went to the town the same day to resume his seasonal begging tour and to find out if anyone knew the secret transaction between him and Stein. On 1st June, Wang Jiayan went to the Mogao caves to see Stein and convey Sheng Yun's orders. Wang Jiayan, who was utterly ignorant of Cave 17, came too late to affect Stein's transaction with Wang Yuanlu. Glad though he was about this, Stein could not help feeling uneasy when he learned of Wang Jiayan's purpose. On the morning of 2nd June, Stein sent Jiang Xiaowan to town for a couple of days in order to get Wang Jiayan to write plain reports to Chong Jun (崇俊), Daotai of Suzhou, and to Sheng Yun, explaining that his own work lay all in the desert and the nature of it was harmless. On the evening of 5th June, Jiang Xianwan returned from the town with assurance that Wang Jiayan had sent report by wire to Suzhou explaining the innocent nature of Stein's 'hobby'. At the same time, Wang Yuanlu also returned from the town with assurances that nobody knew about the secret transaction. Wang Yuanlu was encouraged to make a second transaction on 6th June. The whole collection was again brought to Stein's camp at the dead of night for the purpose of deceiving the accompanying Chinese soldiers. After settling the second transaction, Stein began to pack the antiques from 7th June. The unsettled situation and fear of diphtheria forced Stein to leave Mogao as soon as possible. Lin Taiqing came to Mogao to see Stein on the morning of 9th June in the course of his packing. Lin Taiqing's visit shortly after Wang Jiayan's was aimed at examining Stein's acts and persuading Stein to leave this troubled place as soon as possible. Lin Taiqing confided that both he and Wang Jiayan deemed it prudent to delay any military action until Stein was safely out of the district. Seeing that Stein had been attacked by fever and severe facial swelling since 7th June, Lin Taiqing talked exaggeratedly about the prevalence in Dunhuang of the diphtheria epidemic, apparently with the purpose of frightening Stein away as quickly as possible. Stein left Mogao on 12th June. On arrival in Dunhuang town he went to see Lin Taiqing and then Wang Jiayan. He was glad to know that Wang Jiayan had smoothed his way at Anxi and Suzhou. They then reassembled at Lin Taiqing's residence for a quiet meal. Stein left the town of Dunhuang on the evening of the same day, when he found Wang Jiayan and Lin Taiqing with all officials assembled to bid him farewell at a temple outside the city gate. This was Stein's last sight of Lin Taiqing. After Stein's departure from Dunhuang, Wang Jiayan was preoccupied with the tax problem. On 23rd July, Wang Jiayan's soldiers killed Zhang Huming (张壶铭), a peasant leader. News spread quickly and about 3,000 angry peasants launched an attack on the town. Despite the soldiers' heavy fire they broke through the town gate and then occupied the Magistrate's Office. In order to give vent to their anger, the rebels destroyed and burnt away everything in the Magistrate's Office. In the course of this revolt, fourteen soldiers were killed. Reports about the rebellion in Dunhuang were submitted eventually to Sheng Yun. Sheng Yun immediately ordered that Wang Jiayan be discharged from his post and that this ex-Magistrate and a dozen of the chief rebels be sent to Suzhou for judicial interrogation. Stein heard the news about rebellion of Dunhuang at Suzhou. Knowing that no Chinese officials would threaten his archaeological collections, Stein continued his explorations. When Stein returned to Suzhou on 13th September, he saw Wang Jiayan there awaiting a formal court of enquiry. This was Stein's last sight of Wang Jiayan. Stein returned to Anxi on 25th September. During his stay there he took the advantage of the anarchic situation in Dunhuang, dispatching Jiang Xiaowan secretly to Mogao for more manuscripts. This time Jiang Xiaowan acquired for Stein the biggest haul: 230 bundles containing about 3000 rolls. Stein left Anxi on 8th October and arrived at Hami in Xinjiang on 19th October. At Hami, Stein wrote a farewell letter to Sheng Yun with whom he had communicated but never met. Stein boasted that ‘in my farewell letter to the Viceroy sent later on from Hami, Chiang made me put in a good word for Wang (Jiayan). I do not know what attention, if any, was paid to it; but before I left Turkestan Chiang heard the cheerful news that Wang had been finally exonerated and given a fresh magisterial charge elsewhere.’ (14) Wang Jiayan indeed continued his official career in Gansu and Xinjiang until 1913. After completing his Second Expedition, Stein suggested in Calcutta in December 1908 that the government of India should thank Sheng Yun, Wang Jiayan and other Chinese officials. The Government of India and British India Office expressed their thanks to those officials Stein listed. The Times announced on 5th April 1909 that: ‘It is gratifying to know that the Indian Government have lost no time in recognizing the help which Dr. Stein has received from various Chinese officials. His Majesty's Secretary of State for India has been asked to convey the cordial acknowledgement of the Government of India to the officials concerned, through the British Minister at Peking and the Chinese Government.’ Sadly, Chinese scholars did not link Stein with Cave 17 until 1910. (3) MS. Stein 283 f.6. (4) M. Aurel Stein, Ruins of Desert Cathay , Vol. II, p. 14. (5) Ibid . p. 18. (6) Ibid . p. 181. (7) Ibid . p. 232. (8) MS. Stein 204, f.327; Ruins of Desert Cathay , Vol. II, p. 232. (9) Ruins of Desert Cathay , Vol. II, p. 21. (10) MS. Stein 204, f.344. (11) MS. Stein 364, f.78. (12) MS. Stein 204, f.345. (13) MS. Stein 264, f.78. (14) Ruins of Desert Cathay , Vol. II, pp. 336-337. 《国宝流散：藏经洞纪事》 ( The Dispersion of the National Treasuries: Events in the Library Cave of Dunhuang ), Lanzhou, 2007. Detail of Stein manuscript IOL San 2003 (from Khadalik, Stein site no. Kha.i.215-217) showing the corrosive effects of the ink. 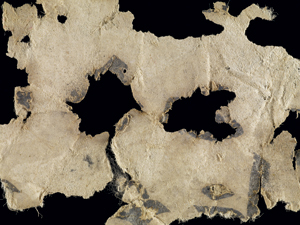 Unlike most of the other Central Asian manuscripts, a small group of seventh-century manuscript fragments written in Sanskrit in the British Library show significant signs of ink corrosion. The identification of the ink(s) used on this group of manuscripts is crucial for discovering the cause of this corrosion but little work has been carried out on the problem so far. This research focuses on the possible types of ink that were available at the time; an analysis, based on the evidence from historical sources, of the materials used to make these inks; actual reconstruction of the inks; and, finally, tests to disclose their corrosive nature. As a first hypothesis, it would be reasonable to assume that the ink was a type of iron gall ink: these are most commonly known for their corrosive nature. However, other types of ink might also result in corrosion. Since the Sanskrit fragments were found at Central Asian archaeological sites, the search for the origin of the ink was initially limited to Chinese, Indian, Persian and Arabic sources, those countries that were culturally, religiously and commercially active in the area in this period and later. Most of the available historical Indian ink recipes are similar to those of many Arabic inks. Indian ink is a combination of carbon black and compounds which are likely to cause corrosion. A thirteenth-century Indian treatise gives vitriol, lampblack and gallnut as major ingredients. (4) Other sources record that gallnut and vitriol were used continuously in two recipes,(5) corroborated by a recipe for black ink in an unpublished seventeenth-century manuscript which states that gum-arabic, lampblack, gallnut (mazu) and Turkish vitriol (Zak-i-Turki) (6) have been used for hundreds of years. From a test on a nineteenth-century Sanskrit fragment written with Indian ink, iron, a corrosive element, was detected. With help from Dr. George Kremer, the ink of Asrarul Khat and two of Quadi Ahmad's inks (using iron sulphate and copper sulphate as additives respectively) were reproduced in the Kremer laboratory. A three-month aging test was then undertaken using two different methods. Three different Chinese modern inks, from the manufacture by Cao Sugong 曹素功, Hu Kaiwen 胡开文 and Yidege 一得阁, the two Quadi Ahman inks and the one Asrarul Khat ink were painted on xuan paper. All samples were divided into two groups. Group one was placed in a container with Glycerol 90% water mixture to set a RH 32% and temperature 70oC environment for three months, after light fasting the sample in Microscal Light Fastness Tester (the LFT1E--500) for eight days. Group Two was exposed under direct sunlight in room temperature and RH for three months in summer. Subsequently, in group one, both the Asrarul Khat's ink samples (with copper sulphate) showed brown discolouration and corrosion on paper. The sample of Quadi Ahmad's ink with iron sulphate reveals brown discolouration through to the verso of paper, and brown halos around the ink writing, whereas the Quadi Ahmad ink sample with alum sulphate shows slight brownish discolouration without any obvious corrosion on the paper. In group two, all Asrarul Khat's and Quadi Ahmad's ink samples showed slight brown discolouration developing through to the back of paper, but no corrosion. All the Chinese inks in both groups showed no discolouration or corrosion. To detect better the tannin and metallic elements in ancient ink recipes, especially Chinese ink, FTIR Spectroscopy and X-Ray Fluorescence are recommended for further research. (1) Li Xiaomei 李孝美 (1095). Mopu fashi 墨谱法式. In Huang Binhong 黄宾虹 and Deng Shi 邓实 (edd.). Meishu congshu 美术丛书, Vol.6. No.6, (Taipei: Yiwen 1947): 105-179. (2) Tsien Tsuen-hsuin. 'Paper and Printing.' In Joseph Needham. Science and Civilisation in China , Vol.5, Part.1, Section 32 (Cambridge University Press 1985): 243. Chao Guanzhi 晁贯之 (c. 1100), Mojing 墨经, Qinpi 秦皮, Sumu 苏木. (3) Xie Yulin & Chen Yuansheng. 'Studies on Conservation of Chinese Ink Stick'. Science of Conservation and Archaeology 14 (1997): 16-19. (4) Gode, P. K. '12. Recipes for Hair-dyes in the Navanitaka (C.2nd Century A.D.) and Their Close Affinity with the Recipes for Ink-Manufacture (after A.D.1000). In P. K. Gode (ed.). Studies in Indian Cultural History (Hoshiarpur: Vishveshvaranand Vedic Research Institute 1960): 99-110. (5) Bailey, G. A. 'A Palette for A Princess: An Unpublished Source on Indian Pigments, South Asian Studies 13 (1997): 50-51. (6) Bukhari, Y.K. 'Pigments'. Marg 16 (1962-63) supp ii-iii. (7) Ravines, P. and Dehghan, N. 'Carbon Black Inks from the Middle East'. In Jane Eagan (ed.). IPC Conference Papers 1997. (Leigh, Worcester 1998). (8) Levey, Martin. 'Some Black Inks in Early Mediaeval Jewish Literature'. Chymia, Annual Studies in the History of Chemistry 9 (1964): 27-31. (9) Ravines, P. & Dehghan, N., op. cit. 189-195. The IDP conservation pages, written and collated by Barbara Borghese, went live in December after several months of editing and testing. They include an introduction to conservation, conservation specialisms — illustrated with videos and case studies — details of IDP past and ongoing conservation and science research projects, resource pages including conservation papers, lists of relevant journals, a glossary, a bibliography, and links to other sites. IDP hopes that this new resource will become a valuable instrument for both professionals in the field of conservation as well as for people with a general interest in the topic. Comments and suggestions on issues related to the conservation pages are welcome. 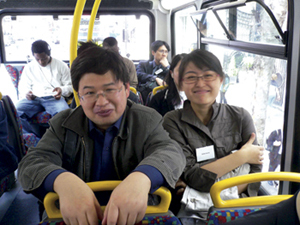 Lin Shitian and Zhao Daying from the National Library of China, along with other conference delegates on a London bus travelling from the British Library to the Courtauld Institute session of the IDP Conservation Conference. The Seventh IDP Conservation Conference was held on 21st-23rd May 2007 at the British Library London. Fifty-nine delegates attended with additional staff from the British Library attending the first day. The conference offered delegates an excellent opportunity to meet, discuss and share their knowledge and expertise in the field of oriental conservation. The conference takes place approximately every two years and has become a focus for those involved with IDP, the Silk Road and the care and study of Chinese and Central Asian Collections. This year's event included several new features, including two practical workshops focusing on conservation treatments and an afternoon session hosted by the Courtauld Institute of Art in London. Thanks to Sharon Cather and her staff at the Courtauld for hosting this event. The first day was largely devoted to advances in conservation research and reports from IDP affiliated institutions (see below). The second and third days were devoted to practical activities including workshops and round table discussions where participants had the chance to engage in fruitful discussions and to learn and practise new conservation skills (see report below). 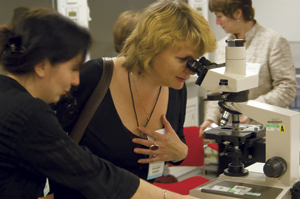 Agnieska Helman-Wazny showing a workshop participant paper fibre samples. 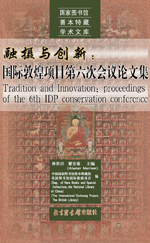 In the past IDP has instigated research initiatives focusing on material properties and material characterisation including investigation into the origin of the dyes used on Dunhuang and other Silk Road items, paper analysis and forgery of manuscripts, among other subjects. Details of all these are given on the new conservation pages under Conservation Projects. An investigation into the composition of historic inks found on collection items has been the focus of a research project carried out under the auspices of IDP by Xuhua (Sylvia) Zhan, a student completing a master degree in conservation, who studied ink recipes used on the ancient Silk Road. Her preliminary findings were presented at the conservation conference and a resume of her paper is published above. Further results will be posted on the IDP online conservation pages. Flavio Marzo describing binding techniques. Two workshops were presented as part of the Conservation Conference. They were held in the newly opened British Library Centre for Conservation, and were the first event of this kind to be held in the new venue. 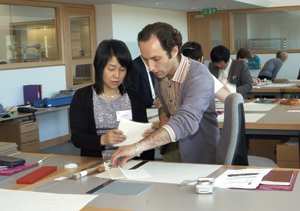 The first workshop, organised and run by Mariluz Beltran de Guevara and Flavio Marzo, of the British Library Conservation Department explored traditional Asian binding structures and was attended by fifteeen conservators from six countries. The second workshop, entitled The Composition of Asian Historic Papers and run by Agnieska Helman-Wazny and Anna-Grethe Rischel familiarized participants with analytical techniques and various paper and fibre types in order to characterize and qualify Asian papers more accurately. Both workshops were a great success and IDP has received many requests for a re-run of the events. A detailed account of both workshops with images will shortly be published on the IDP Conservation Pages. High-quality IDP postcards showing a range of items from the British Library's Central Asian collections are available to buy through IDP, with profits going directly to our work. PLEASE REMEMBER to include your full mailing address. 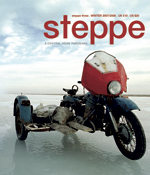 For further details and to subscribe visit the Steppe Magazine website. 'Conference Report: Marking the Centenary of Dunhuang' , Daniel Waugh. For an online newsletter and pdf see the SilkRoad Newsletter website. For online newsletter and pdf see The Central Eurasian Studies Website. To order: $70 + shipping. For earlier volumes, a 50% DISCOUNT on vols. 5-15 is now available, as well as vols. 1-4 on CD ROM disk for $15 each. + shipping. Website of the Bulletin of the Asia Institute. Articles in honour of Professor Roderick Whitfield : by Wen C. Fong, Timothy Barrett, Philip Denwood, Amy Heller, Puay-Peng Ho, Angela F. Howard, Regina Krahl, Liu Heping, James Lin, Meng Sihui, Ning Qiang, Helen Wang and Wang Tao, Dorothy Wong,Yen Chih-hung, Peter Zieme. The Kšanti Kilguluk Nom Bitig is one of the most important Uygur Buddhist works and has been copied time and again. Forty-four different manuscripts from several sites have been identified. The edition is accompanied by a translation into German, an extensive commentary, a transliteration of all the fragments and a glossary (Uygur, Chinese, German). For more details and to order see the Brepols website. 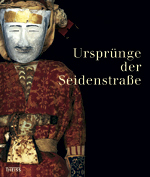 Articles by leading scholars in the field along with a bibliography of Kogi Kudara. A volume in the Encounters with Asia series Using a diverse range of sources, including many Russian sources, E. E. Kuzmina, renowned Russian archaeologist, looks at the history of the Eurasian steppe before the formal establishment of Silk Road trade and diplomacy. From the late Neolithic period to the early Bronze Age, Kuzmina traces the evolution of the material culture of the steppe and the contact between civilizations that proved critical to the development of the widespread trade that would follow, including nomadic migrations, the domestication and use of the horse and the camel, and the spread of wheeled transport. The book is complemented by an extensive bibliography. For more details and to order see the University of Pennsylvania Press Website. This is a new study of the history, archaeology and numismatics of Central Asia, an area of great significance for our understanding of the ancient and early medieval world. This vast, land-locked region, with its extreme continental climate, was a centre of civilization with great metropolises. Its cosmopolitan population followed different religions (Zoroastrianism, Christianity, Buddhism), and traded extensively with China, India, the Middle East, and Europe. The millennium from the overthrow of the first world empire of Achaemenian Persians by Alexander the Great to the arrival of the Arabs and Islam was a period of considerable change and conflict. To order see the Oxford University Press website. This new volume, containing seventy letters and three Buddhist texts written in northern Afghanistan between the fourth and the eighth century AD, completes the publication of all Bactrian documents so far known. (Some of these can be seen in the IDP database: enter 'bactrian' as search value.) In addition to the Bactrian texts and English translations, presented on facing pages, the volume includes a short sketch of Bactrian grammar and a full glossary which also covers the vocabulary of the preceding volume (Bactrian Documents from Northern Afghanistan, Vol. 1: Legal and Economic Documents, 2001, currently out of print). This is a spectacular exhibition showing recent finds from Xinjiang, western China, dating from 4000 years ago through to the fourth century AD. The finds, which are mainly from steppe and nomad cultures, show the links of peoples in this area with adjoining regions, including China. Undoubtedly the most striking exhibits are the textiles, which range from trousers made of a tapestry with a Hellenistic design showing a centaur, a child's patchwork smock and, the most complete and refined of all the pieces, a complete suit of clothes found in a burial, complete with a face mask decorated with gold leaf and a miniature kaftan lying on the chest (see image on catalogue below). Herausgegeben von Alfried Wieczorek und Christoph Lind. 300 pp., 300 colour illus. This fully illustrated catalogue to the above exhibition contains details of all the items, introductions to the sites, and scholarly essays by experts in the field covering the archaeology, environment and history of the region, along with one essay on the textiles. For further details see the Berliner Festspiele Webpages. 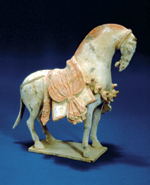 Left: Caparisoned horse, China, about 525–30., earthenware with traces of polychrome pigments, UMMA, Gift of Dr. D. K. Lieu, 1950/2.12. This exhibition, organized by the University of Michigan Museum of Art (UMMA) and drawn from their renowned collection, covers over 1000 years of Chinese porcelains to illustrate the important role of foreign trade and changing domestic markets in stimulating Chinese potters — and their counterparts in Japan and Korea — continually to reinvent their repertoire of shapes and decorative techniques. The first part traces the exchange along the Silk Road between the Chinese Han (206 BC– AD 220) dynasty and ancient Persia and the Mediterranean world between the second and tenth centuries. The second part features coloured porcelains made for domestic use and foreign exchange during the Qing dynasty (1644–1911); and the final section focuses on the competition between kilns for imperial patronage and the Chinese influence on later Japanese and Korean ceramic traditions. or visit the Kresge Art Museum Website. The National Library of China (NLC) in Beijing has been busy recently with the new library building which will officially open next year. This will offer enhanced digital services and space. In the meantime, the IDP Studio has expanded. A new P45 camera back and Mamiya body were received as part of the Ford Foundation project and IDP UK staff spent a week on training new staff on photography, manipulation and the database. The expansion is possible thanks to the continuing generosity of the Sino-British Fellowship Trust. A facsimile of the Diamond Sutra , the printed copy from Dunhuang dated to AD 868, was produced by the NLC for distribution to educational institutions throughout China as part of a state project to reproduce important historical manuscripts and texts. 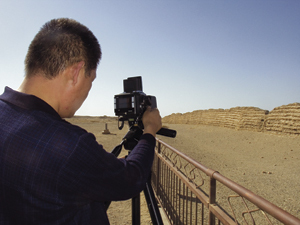 Dunhuang Academy photographer, Sheng Yanhai, photographing the Han-period wall near Dunhuang with the new P45 digital camera back. A new IDP Centre opened in Dunhuang in late 2007 to start work on digitising of the manuscripts at the Dunhuang Academy and, following this, elsewhere in Gansu, and to work together on educational projects under a Ford Foundation Grant. IDP UK staff spent a week with colleagues at the Dunhuang Academy in October carrying out training and learning about Dunhuang and the work of the Academy. There will be a reciprocal visit in May next year of DHA staff to London to work together on an educational workshop. The Institute of Oriental Studies (IOS) helped organise and hosted the second symposium sponsored by the Ford Foundation (see below for report). The Mellon-funded project was completed successfully by the Institute of Oriental Studies in 2007. In total 6,127 images were sent to Mellon for inclusion on MIDA part of Artstor. All these images are also available on IDP. IOS successfully applied for a Endangered Archive Grant to digitise its Tangut manuscripts. Work will start shortly. In the meantime, work is continuing on digitisation of the Chinese scrolls, after which work will start on the Chinese fragments. IOS also applied to the Ford Foundation for a grant towards an exhibition of Russian expeditions on the Silk Road to be held at the Hermitage in late 2008. Dr Popova, IOS Director, visited China in October 2007 to discuss this exhibition. Full details of the exhibition will be given in the next issue of IDP News . Congratulations to Alexander Zorin, curator of the Tibetan manuscripts at the IOS, who was awarded his PhD in July, following his public defense in December 2006 at St. Petersburg State University. His thesis, supervised by the late Professor Lev N. Menshikov, was entitled The Sources of Tibetan Poetry: Stotra Hymns In Tibetan Literature (8th – 14th centuries) and examined a genre of Buddhist hymns as they are represented in the Tibetan canon. It classified them by themes, analyzed their stylistics and composition, defined their functions, and tried to show how much the borrowed texts influenced the later Tibetan tradition of hymn writing. Photography of the folios of the Codex Siniaticus held at the Russian National Library was carried out by the IOS in their IDP Photographic Studio in November. These images will join images of the other folios held in Britain, Greece and Germany to form a new facsimile edition. The digitisation of the 7,000 manuscript fragments of the Otani collection held at Ryukoku University was completed in October. Photography of the fifty scrolls in the collection started in May and will finish shortly. This work is being done on the Seta campus with a new PhaseOne P45+ camera. Along with photography, the manuscripts are also subjected to a number of physical measurements, among which the measurement of the density of laid paper looks especially promising, the relevant data being entered into the database. 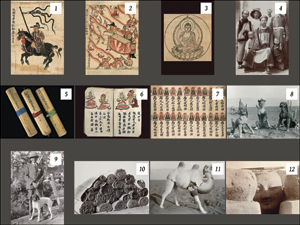 It is hoped that this information will be useful in dating and authenticating Dunhuang manuscripts and in comparing the Otani material with material in other collections. Professor Enami Kazuyuki has continued to be actively involved in the analysis of the paper material used in the manuscripts of the Otani collection. The compilation of a bibliography of academic books and articles related to the collection has been in progress since April. An updated catalogue originally published by Professor Oda Yoshihisa is also being prepared by Professor Tsuzuki Akiko and is expected to be completed in spring 2009. The final catalogue will be made available online on IDP. In August, IDP members Sakamoto Shouji and Imre Galambos paid a visit to the Lüshun Museum exhibition held in Aomori. They also visited, along with Professor Mitani Mazumi, the local Kogyoji temple where among the personal items of the late abbot Nimoto, a significant amount of material was preserved relating to Otani Kozui and his journal Daijo (Mahayana) . The material comprised letters, photographs, autograph copies of published articles, and even Otani's passport. Plans for the organizing work of this material are in process. In early October Kitsudo Koichi finished cataloguing the newly discovered Tachibana fragments. The 181 fragments from Tachibana's trip to Xinjiang were found earlier this year in the collection of the late Professor Ogawa Kan'ichi who had been given these by Tachibana himself. Most of the fragments have Chinese text on one side and Uighur or Sogdian on the other. 2nd June: At the 24th Meeting of the Japan Society for the Study of Cultural Properties, Fujimoto Shin'ichiro (Professor Enami's student) presented a paper with the title: The study of the paper of the Uighur manuscripts in the Otani collection . 2nd July: Imre Galambos gave a talk at Ryukoku University titled Otani Kozui's 1910 visit to London . 14th July – 22nd August: Exhibition of Central Asian collection of the Lüshun Museum, held at the Aomori Museum of Art. This was one of the rare occasions when items from the original Otani collections now kept in Lüshun came back to Japan. Ryukoku University actively participated in the exhibition as an organizer and exhibitor. 10th December: An exhibition organized at the Omiya campus under the title The world of digital archives at Ryukoku University . The exhibition also includes a display demonstrating the work carried out by IDP and the use of the IDP database. 14th December: Dr Sakamoto Shouji presented the paper Developing the IDP database: The Archive of Manuscript Scrolls at a Humanities and Computers symposium entitled Digital Archives and Their Point of View in Time and Space , held at Kyoto University. There are now almost 10,000 images of Chinese fragments online on IDP from the Berlin collections along with five catalogues thanks to the work carried out at the Berlin Brandenburg Academy of Sciences and Humanities (BBAW) over the past two years. A grant is now pending for work to digitise and include the c.14,000 Sanskrit fragments on IDP. The most recent publication of the Berlin Turfantexte, Das Buch von der Sündentilgung. Edition des alttürkisch-buddhistischen Kšanti Kılguluk Nom Bitig Teil 1 + 2 , by Jens Wilkens was published. Details are given in Monographs. The second symposium held under the project Bringing Together Scholars, Scholarship and Scholarly Resources on the Silk Road (China – India – Russia) 2006-2008 sponsored by the Ford Foundation took place on 25th-27th April 2007 at the St. Petersburg Branch of the Institute of Oriental Studies (IOS), Russian Academy of Sciences. The topic chosen was Chinese and Tibetan influences on Tangut art and religion, with particular reference to esoteric Buddhism. After the welcoming speeches, Professor E. I. Kychanov showed delegates from China, India, Russia and the UK examples of Tangut manuscripts from the IOS collections as well as giving an introduction to the history of the Tangut collections held at the IOS. Over the following two days, a range of papers were presented on the Tangut collections in Russia, China and France, as well as papers on Tibetan Buddhism in the Tangut kingdom, and Central Asian rock art. 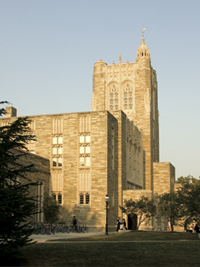 The Princeton East Asian Library. The afternoon session on the second day was held at the State Hermitage Museum where Dr K. F. Samosuk, curator of the Hermitage Tangut collection, gave a paper on mythology and iconography in paintings from Kharakhoto. On the final day, the web resource on Tangut studies prepared by the project's Chinese coordinator Dr Saren Gaowa of the National Library of China was discussed, followed by a final viewing of Central Asian manuscripts in the IOS reading room led by Dr M. I. Vorobjeva-Desyatovskaya. The third and final symposium under this project will be held at the Indira Gandhi National Centre for the Arts, New Delhi, India, from 17th-19th March 2008 on the history of the Central Asian collections worldwide. See IDP educational research pages. Thanks to a grant from the American Trust for the British Library, an IDP digitisation team spent one week in New York and Princeton in September digitising material for inclusion on IDP. They photographed one scroll at the Morgan Library, New York and one at the Princeton University Art Museum. They then spent three days photographing fragments and a further scroll in the Princeton East Asian Library (pictured left) and from a private collection. The material will go online on IDP in early 2008. An eminent art historian on India and Central Asia, Dr. Banerjee was born in present-day Bangladesh. He obtained a PhD from Patna University in 1949, performing research on Indian history and religions, inscriptions and coins. He read many inscriptions and was awarded a Smithmundt and Fulbright Scholarship, and a Fellowship of the Indian Council of Historical Research and Indian Institute of Advanced Study. He trained in archaeology and joined the publication department of the Government of India to write the monograph The Way of the Buddha . He played a pivotal role in building the National Museum from scratch as well as organising an exhibition of Buddhist art in Rangoon, Myanmar. He also set up the Zakir Hussain Galleries and founded the Sri Krishna Museum. His leadership and erudition gave the National Museum scholarly recognition. He served many committees as Member, Vice President, Chairman, and was Examiner at Calcutta University, Jawaharlal Nehru University, and Punjab University. He delivered lectures on Indian and Central Asian art at various institutions in India and abroad, travelling extensively to the USA, Russia, France, Germany, Japan, and Myanmar for scholarly work. 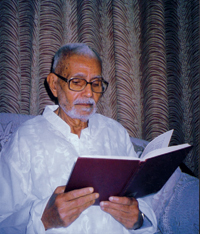 Dr Banerjee published more than two hundred research articles and twelve books. His devotion and dedication to research is evident in his three unfinished monographs on Central Asia which are being completed by his daughter Dr Radha Banerjee and son-in-law Mr Deepak Sarkar as a tribute. A research journal is to be launched very soon in the memory of late Dr P Banerjee. He was a simple and honest man who dedicated his life toward the enlightenment of the scholarly world. IDP UK was very sorry to say goodbye to Márta Matkó at the end of September. Marta has worked for IDP on a consultancy basis over the past two years as part of the Leverhulme research project. A Tibetan specialist, she was helping Sam van Schaik in recording palaeographical and codicological data on the IDP database. Her work has been invaluable. She is returning to her home town in Hungary with her husband who has a job there, but we hope she will be able to carry on doing some work remotely. Lazarus Halstead, undergraduate in Archaeology and Anthropology at Keble College, Oxford, spent three weeks as an intern with IDP, working on bibliography, XML, and archaeological sites. IDP UK also welcomed Saren Gaowa from the National Library of China and Anastasia Kolosova from the Institute of Oriental Studies, St. Petersburg for two-week internships in July and November as part of the Ford Foundation project. IDP staff have been involved in several outtreach and research activities over the past six months. Sam van Schaik gave papers at the annual meeting of the American Academy of Religions, San Diego and the Manuscriptology Conference, Copenhagen. His joint paper with Jacob Dalton and Tom Davis on the forensic identification of scribal handwritings appeared in December 2007 in the online Journal of the International Association for Tibetan Studies , and his article on evidence for oral transmission in the Tibetan Dunhuang manuscripts was published in the collection Contributions to the Cultural History of Early Tibet . Imre Galambos presented papers on Otani at conferences in Japan and the UK in July and at Budapest in December. He also prepared journal articles on Otani's visit to London in 1910 and on A. O. Hobbes, an eighteen-year old Englishman who accompanied Tachibana on the second Otani Expeditions and died there. Susan Whitfield gave several papers on Silk Road topics and IDP, including at the London May conference, at the Scriptorium symposium in May (Cambridge, UK), at Princeton in September, Madrid in October, Seoul in November and in Bath, UK in December. She also finished several papers, including an article on Chinese historiography for a set of conference papers, on European explorers of the Silk Road for the forthcoming Odyssey Xinjiang guide, on Stein and Silk Road rivalry for a forthcoming exhibition catalogue and on the origins and definition of 'the Silk Road' as an introduction to a the forthcoming issue of The Journal of the International Association for the Study of Traditional Asian Medicine . She also completed a children's book on Afghanistan and lectured to various groups of students in the UK. Two major new sections of the website have recently been launched.following several months of preparation,editing and design. Details of the pages on conservation, prepared by Barbara Borghese, are given in the Conservation section. The Education and Research pages, prepared by all of IDP but with special input from Alastair Morrison and Abby Baker, offer many resouces for teachers and students of all levels. Work is now underway on preparing palaeographical tools and the 'My IDP' functionality, both of which will be available by sping 2008. IDP organised its first 'Teachers' Inspiration Event' entitled Buddhism and the Silk Road in November. Held at the British Library, it including a visit to the Foguangshan Buddhist temple in central London. The event was fully subscribed and included an introduction to the temple's activities and to IDP's web-based educational resources. IDP staff gave presentations on how IDP resources on Buddhism could be used in the classroom. Teachers were given a resource pack of text and images. IDP is extremely grateful to its major funders who ensure the continuation of IDP's work. Sam van Schaik and Imre Galambos successfully applied to the Britsh Academy for a Stein-Arnold Fund grant to cover a research visit to western China. Their research concerns a Dunhuang manuscript in Tibetan and Chinese which is a series of letters of passage for a travelling monk. They are planning to try to retrace the steps of the pilgrim as part of this. An article is in preparation. We were also fortunate to have received a grant from 'Connections Through Culture' (The British Council) that enabled John Falconer, Head of Visual Materials at the British Library, to travel to Beijing in October to discuss a major exhibition of the historical photographs by Europeans of China to be held at the National Library of China from September to October 2008. A grant from the American Trust for the British Library enabled the purchase of a portable digitisation unit and travel expenses for an IDP team to work with colleagues at US institutions to make Dunhuang and Silk Road material available on IDP (see IDP at Princeton). This resulted in a very successful collaboration and we hope to work with other US institutions in the coming years. One of IDP's challenges is to find a regular source of funding for its core work – one of the most needed, and yet most difficult, parts of our work to fund. We are therefore launching a SILK ROAD SUPPORTERS scheme. By becoming an Amber, Lapis, Jade or Life Supporter, you will make an extremely valuable contribution towards preserving the Silk Road heritage for generations to come and enable IDP to plan ahead and devote more time to carrying out core work instead of fundraising. The scheme is deliberately very simple as we do not want to spend unnecessary time and money on administration: please encourage everyone you know to support us. For further information, contact Sarah Biggs.